HoloLens: The Future of Enterprise | Also Creative Inc. In our last post we announced our approval to become developers for the Microsoft HoloLens. There are videos all over the internet about what virtual reality can do for gamers, but what can augmented reality do for enterprise? The HoloLens has the potential to change the way we do business. With so many companies already working with Microsoft, there is no doubt that augmented reality will redefine the way we live and work. Lowe’s has begun working with Microsoft to create a new in store experience for homeowners starting with kitchen design. Customers will be able to virtually design their kitchens and quickly change between materials and colors making this an affordable solution for showcasing new materials and appliances without actually having to redesign displays. The designs can even be viewed as small models in order to make more accurate decisions . It doesn’t stop with home design, Volvo is also working with Microsoft to develop their own HoloLens software to design cars, as well as help customers through their buying processes by allowing them to flip through color options and other customizable features. It is also able to demonstrate safety features in front of you making the overwhelming experience of car buying a little easier . 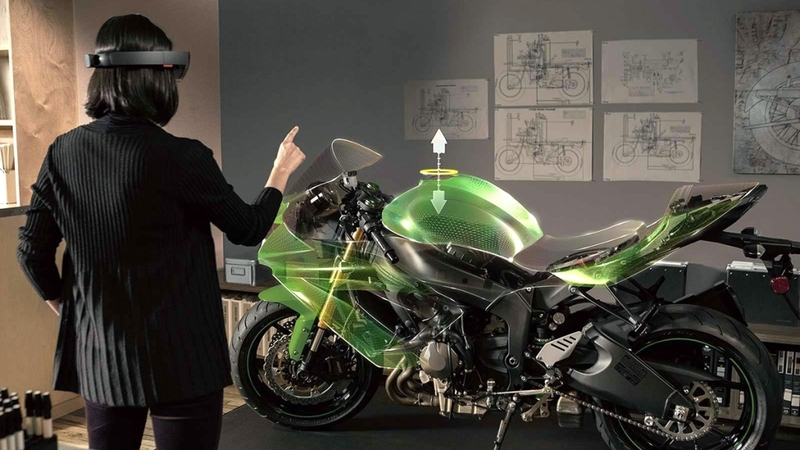 Microsoft has developed a new program called HoloStudio which is able to build objects in 3D rather than 2D. This program will prove to be especially useful for those who utilize 3D printing, which can be time consuming and expensive. With HoloStudio you can build your objects freely in 3D and re-size and reshape them as necessary before printing your object ensuring that it is exactly how you want it. This can be used in the industrial business sector as a way to test models before building them. Trimble, an architectural firm, has teamed up with Microsoft to create a new way to create and share blueprints. Using the HoloLens, architects can design in 3D allowing them to view the project as realistically as possible. They are even able to make changes to projects using a mouse that can move from a PC to the hologram . Dr. Mark Griswold of Case Western Reserve University demonstrated how medical students could work interactively with 3D models of the human body for studying anatomy using HoloLens by separating parts of the body to see how they work together. The application possibilities of augmented reality for education appear to be limitless such as 3D models of dinosaur fossils for studying Paleontology, engineering students creating models of robots, getting an up close look at the Mona Lisa and the Statue of David while studying Fine Arts, or taking a more realistic step back in time for History courses . This is only the beginning of how our world will be changed by the Microsoft HoloLens and similar products. In our next post we will explore the ways that HoloLens will change the way we experience entertainment.